The Academy of St Martin in the Fields is strongly committed to passing on our passion through our Learning and Participation work, aiming to deliver dynamic, inspiring and participatory music-making projects and provide access to participants of all ages, backgrounds and abilities. 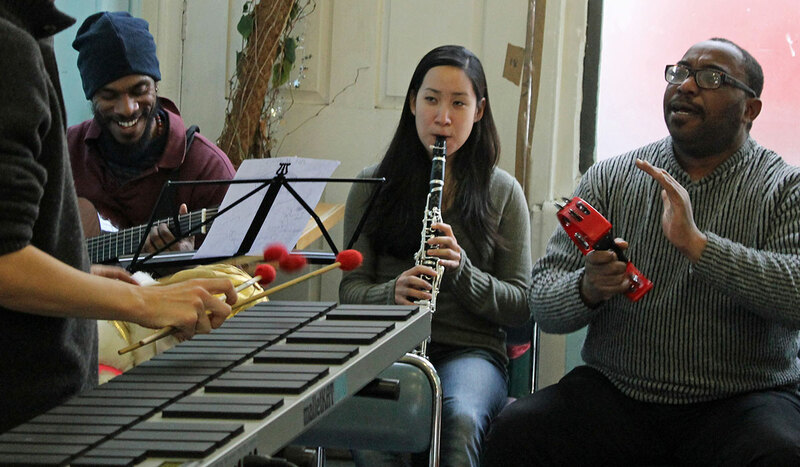 Since 1998 the Academy has been working to empower homeless and vulnerable adults through music-making. Often homeless adults are affected by experiences of rejection, addiction or mental illness, and while material benefits such as food and clothing provide necessary aid, the personal, social and therapeutic benefits of music-making can alleviate daily pressures and provide the strength for individuals to make long-lasting changes to their personal circumstances. Over the years, the Academy has developed various creative projects introducing song writing, composition and improvisation activities which have inspired and given participants the opportunity to be creative individuals and feel empowered by the confidence and support that making music with our players brings. Academy musicians work with participants from the WLM Seymour Place over six months each year in a sustained programme of music-making: a series of informal improvisation, composition and creative workshops with the aim of increasing the self-confidence and musicianship of the adults involved. We were delighted to take part in the Museum of Homelessness’ State of the Nation weekender in April 2017 at Tate Modern’s Tate Exchange. The weekend brought together a rich mix of perspectives on homelessness from a range of guests including artists, politicians and people with experience of homelessness. Academy musicians performed pieces composed by members of the WLM Seymour Place group in response to artwork displayed at Tate, as well as performing alongside members of the group. Watch one of the performances from this project in the video below, and see more of the compositions on our YouTube channel. Open to all ticket-holders free of charge, the majority of our London concerts are preceded by a pre-concert talk, where an Academy musician is joined by the guest soloist/director for the evening to offer insight into the concert’s repertoire, the experience of working with the Academy, and short stories and anecdotes shedding light on life as a professional musician. Questions from the audience are welcome (and encouraged!). The Academy is committed to the safeguarding of vulnerable adults involved in all of our learning and participation projects. Click here to read our full vulnerable adult safeguarding policy.